Last month I cleared lots of clothes from my closet to sell on consignment at Into the Wardrobe. I'm looking forward to getting store credit for fresh thrifted goodness. Meanwhile, one benefit of doing this is feeling motivated to find more ways to wear the fewer clothes I currently own. This is one of my "new" outfits. 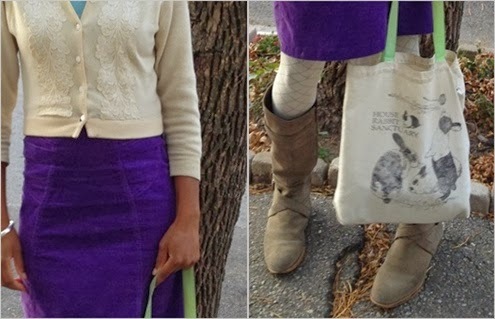 I am so in love with the mix of textures: micro-cords, lace, the softest cashmere, suede ... even the tights have a pattern made out of texture. Speaking of the tights: It feels so good to finally wear these things! I don't find much opportunity to wear cream colored tights. Do you? What about you? Have you been wearing any texture this week? Having every color tights sounds dreamy! My favorite color tights is teal. It looks good with everything. I have a pair of cream sweater tights that I can't wait to wear. So cute - I love tights and today I wore footless ones - so comfy! Hopped over from The Pleated Poppy. Stopping by from the WIWW! Love the color of this skirt! Such a cute outfit with the tights and boots. thanks Chandra! <3 I had a nice weekend. hope your week is great! ooo, sweater tights are my favorite! <3 thanks for commenting!